of Californians on a limited budget, the sanctuary program brought together more than 100 ocean-related businesses, agencies and organizations and formed the Ocean Communicators Alliance to promote shared ocean messages. In partnership with the State of California, the program developed a public awareness campaign called Thank You Ocean with the theme, “The ocean takes care of us...let's return the favor.” The campaign reaches millions in California with messages that highlight the connection between humans and the ocean and suggestions on how people can make a difference, found on the campaign Web site: http://thankyouocean.org. 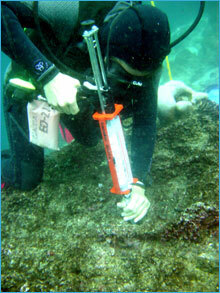 Program staff are working with other countries who look to NOAA for our expertise in managing marine protected areas. Conversely, we learn from their resource protection methods. In July, staff experts traveled to one of the world’s last great marine conservation areas -- the Galapagos Islands. Their job: to work with staff from the Galapagos National Park and Marine Reserve on implementing a system of mooring buoys in tourist sites to alleviate damage caused by vessel anchoring. Installing the buoys, a first for the Galapagos, will protect the region’s seafloor from anchoring which can disturb, and in many cases destroy key invertebrate communities and soft coral. The program also has partnerships with Australia, Italy and South Korea to share knowledge about managing protected areas in the ocean. Billed as the largest aquarium in the world, the Georgia Aquarium is poised to be a leader in ocean literacy and a venue to bring sanctuary life to the public. The aquarium features more than 120,000 fish representing over 500 species. 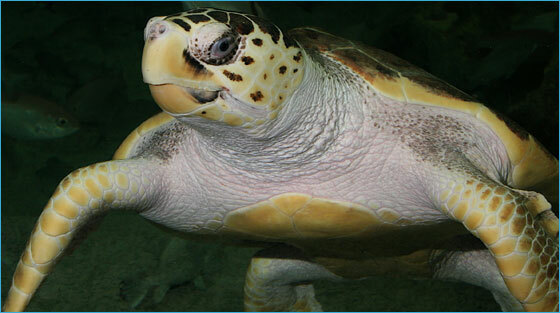 Exhibits feature sea turtles and the wildlife of Gray’s Reef National Marine Sanctuary, and a number of touch tanks with rays and sharks. The Georgia Aquarium is key to helping educate more than a million visitors each year. An innovative partnership facilitated by the National Marine Sanctuary Foundation, the sanctuary program’s non-profit arm, is giving the public new access to the beauty of the sanctuaries. Marine Sanctuaries Media is the first private company to offer value-added products in a manner similar to how private companies sell NOAA nautical charts. A portion of the revenues go back to the sanctuary foundation to support sanctuary education projects. From the company’s Web site, visitors can purchase stunning images taken within the sanctuaries. From lighthouses to coral reefs and from shipwrecks to humpback whales, Marine Sanctuaries Media provides high-quality visual products that are not available anywhere else. This latest venture highlights one of the many ways the foundation develops partnerships to promote sanctuaries.